Everyone wants to eat healthier, but many of us are too busy for the kind of cooking that requires long recipes and even longer cooking times. Some days, it may be tough enough just to find the energy (or time) to even boil water. One sure-fire way to ensure that you can enjoy quick, easy, and healthful vegan meals is to have a well-stocked plant-based pantry close at hand. When your body says “healthy home-cooked meal” and your mind says “where’s the take-out menu?” your best solution is to have an arsenal of delicious go-to dishes that you can put together quickly using items already in your cupboard, fridge, and freezer. When you keep a well-stocked pantry and freezer, you are always minutes away from a healthy, great-tasting meal. Whether you rely on canned beans and quick-cooking grains or cook your own large batches of beans and rice to portion and freeze, a good supply of grains, beans, and seasonings provides the basis for quick and delicious pantry meals. Stock your pantry with interesting sauces, seasonings, and condiments, so you can explore the flavors of the world without leaving your kitchen. Such ingredients can help you to build healthy vegan dishes with great flavor combinations, making for endless variety and allowing you to transform your everyday pantry items into extraordinary meals. Cooking with on-hand ingredients can also save you money. When it’s easy to whip something up, you’re less likely to reach for convenience and processed foods or take-out menus. Incorporating nutritious plant-based ingredients, such as beans, grains, and vegetables, also ensures that you eat healthy, well-balanced meals even on the fly. Any well-stocked plant-based kitchen should include a variety of vegetables, fruits, and herbs; a selection of dried or canned beans; pasta, rice and other grains; basic seasonings; nondairy milk, nuts, seeds, and nut butters; as well flours and other standard baking items. To get the most out of your pantry, you should stock it with ingredients for recipes that you and your family will enjoy. Stock up on extra items that you use a lot, such as canned tomatoes or canned beans, peanut butter, pasta, and so on. Even if you cook beans from scratch, it’s a good idea to keep some canned beans on hand in case you run out. Beyond these basics, you’ll want to include particular ingredients in your pantry for your favorite cuisines. To cook with Mediterranean flavors, for example, stock your shelves with artichoke hearts, olives, roasted red peppers, capers, sun-dried tomatoes, and dried porcini mushrooms. For dishes with an Asian flair, keep flavor enhancers on hand such as tamari, toasted sesame oil, chili paste, sriracha sauce, fresh ginger, rice vinegar, and hoisin sauce. Pantry items are not limited by what’s on the shelf. They also extend to items stored in your refrigerator and freezer. For example, the fridge is where perishable staple foods such as tofu and almond milk are kept, as well as open jars and bottles of condiments and sauces. The freezer is where you can stock up on frozen vegetables such as spinach, green peas, and edamame. I also like to keep a bag of frozen bell pepper strips on hand for stir-fries, as well as cooked rice, beans, seitan, and other foods that can be prepared and conveniently divided into meal-sized portions for freezing or refrigerating. To illustrate how easy it is to get a healthy and delicious dinner on the table using pantry ingredients, here are four recipes from my book: Cook the Pantry: Vegan Pantry-to-Plate Recipes in 20 Minutes (or Less!) (Copyright © 2015 Robin Robertson, used by permission Vegan Heritage Press, LLC.). Soy Curls. You can also add some dark red kidney beans, if you like, to change things up a bit. If using Soy Curls, place them in a heatproof bowl with enough hot water to cover and set aside for 10 minutes to reconstitute. Combine the ingredients (including the reconstituted Soy Curls, if using) in a saucepan, reserving 1/2 cup of the corn. Cover and cook over medium heat, stirring occasionally, until heated through and the flavors are well blended. Add as much water as needed to create a sauce and prevent sticking to the bottom of the pan. Reduce heat to medium and simmer, stirring frequently, until heated through and long enough to cook off any raw taste from the chili powder, about 15 minutes. Garnish with the remaining corn kernels. The addition of nutritional yeast and a little vegan butter give grits a cheesy flavor without the cheese. If you like, you may add 1/2 cup of shredded vegan cheddar for more cheesy goodness. The amount of time needed to cook the greens will depend on the type of greens you use and whether they’re fresh or frozen. Cook the grits according to package directions. (It should take about 5 minutes for quick-cooking grits.) Stir in the butter, nutritional yeast, and salt and pepper to taste. Keep warm. While the grits are cooking, heat the oil in large skillet over medium heat. Add the scallions and garlic and cook 1 minute. Add the mushrooms and cook 3 minutes to soften. Sprinkle on the liquid smoke and smoked paprika, tossing to coat. Add the greens and broth, and season with salt and pepper to taste. Cook, stirring, until the greens are tender, 4 to 8 minutes, depending on the type of greens. Taste and adjust the seasonings, if needed. To serve, top the grits with the mushroom mixture. This paella is the ultimate in delicious pantry cooking. The quickest way to get it on the table is by having cooked rice on hand. If you have cooked rice in the freezer, it defrosts quickly in the microwave. You can also substitute a quick-cooking grain such as quinoa, if you prefer. Heat the oil in a large saucepan or Dutch oven over medium heat. Add the onion and cook for 5 minutes to soften. Add the garlic and cook 1 minute longer. Stir in the broth, saffron, paprika, bay leaf, oregano, red pepper flakes, and tomatoes and their juice. Bring to a boil, then lower the heat to medium. Season with salt and pepper to taste, cover, and simmer for 8 minutes. Stir in the peas, chickpeas, cooked rice, artichoke hearts, roasted red bell pepper, olives, and parsley. Cook 3 to 5 minutes longer, stirring gently, to heat through. Taste and adjust the seasonings, if needed. Serve hot. 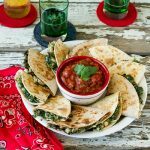 Frozen spinach and canned white beans combine with garlic and spices to make a delec­table filling for these hearty quesadillas. Heat the oil in a saucepan over medium heat. Add the garlic and cook until fragrant, 30 seconds. Add the spinach and season with salt and pepper to taste. Add the beans, lemon juice, coriander, and cumin. Cook, stirring, until the spinach is cooked and the flavors are blended, about 5 minutes. Mash the beans well while cooking. Set aside. Place two large tortillas on a flat work surface. Divide the spinach mixture evenly be­tween the tortillas. Spread the filling mixture evenly on half of each tortilla. Fold the remaining half of each tortilla over the half with the filling and press gently to enclose and spread the filling close to the edges. Heat a large nonstick skillet over medium heat. Arrange the quesadillas in the hot skillet, one at a time or both, depending on the size of your skillet. Flatten with a metal spatula and cook until browned on the bottom, about 3 minutes. Flip the quesadillas and cook until the other side is golden brown. Serve hot. The recipes are from Cook the Pantry by Robin Robertson ©2015. Photos by Ann Oliverio. Published by Vegan Heritage Press. Used with permission. About the Author: Robin Robertson has written more than twenty cookbooks, including the best-sellers Vegan Planet, Quick-Fix Vegan, Fresh from the Vegan Slow Cooker, and One-Dish Vegan. A longtime vegan and former restaurant chef, she has written for VegNews Magazine, Vegetarian Times, Cooking Light, and other magazines. Robin lives in the Shenandoah Valley of Virginia with her husband Jon and six cats. Her Web site is www.robinrobertson.com. You can purchase Cook the Pantry at our online store.